I got some positive...and not so...feedback to my earlier post on this topic. As we speak the band are in LA rehearsing for the upcoming UK promo shows. The sight of the band all fit and healthy is a heart gladdener. 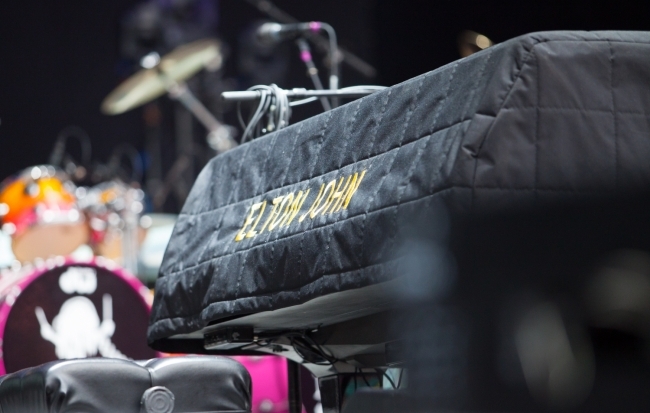 And the fact that Elton is ready and raring to go is the icing on the cake. Loyalty is always a two street in my opinion, I'm sure Elton and Bernie are not autocrats. Change for changes sake is always a bad idea when the ideas well has run dry. The simple fact is session musicians on their own without the support of any the regular band members will always fall short in giving Elton's music the final embellishment it needs and deserves. The most successful albums of his career bear that out. By removing the band members from the creative part of the album, you're disrupting the DNA of an Elton album. The results of which cannot be guranteed, as in any DNA reconstruction experiment. The argument that people use that the band will play on the live versions actually hammers home the case why they should be on the album. Because the live versions with the band put the studio versions in the ha'penny place. Which only further drives home the case for using the band. So with that being the case, why settle for an inferior sounding product when you can have the very best. Another canard that regularly gets trotted out about different musicians getting Elton to be creatively better I'm afriad now has a hole so big a coach and horses can be driven through it. Kim Bullard and Matt Bissonnete have never appeared on a full Elton album. So having them aboard giving new input is the same argument that those who want sessions musicians peddle out. Anyone who has heard Matt's bass playing will know full well the guy is top class, has a lovely melodic touch. Just like the previous incumbents in that position.